When a wine shipment didn’t arrive in time for a scheduled party, we decided to “go rogue.” The results were delightful – six wines we recommend for your springtime sipping. Two days before our party, I had a sinking feeling. The special shipment of wine that was going to be the centerpiece of our soiree hadn’t arrived. There were no messages from UPS or Fed-X. When I contacted the shipper, she explained that there was an unfortunate mistake. Yikes! While our tasting was to focus on a very specific wine region, that was now off the table. We had to “go rogue.” I immediately surveyed the available wine and picked a half-dozen bottles certain to scintillate our guests. 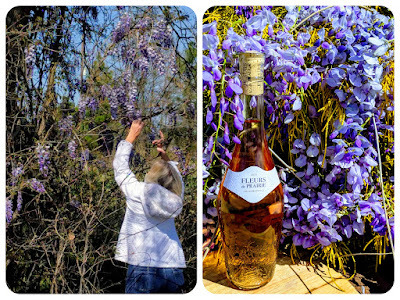 Fleurs de Prairie Rosé - better with Wisteria! 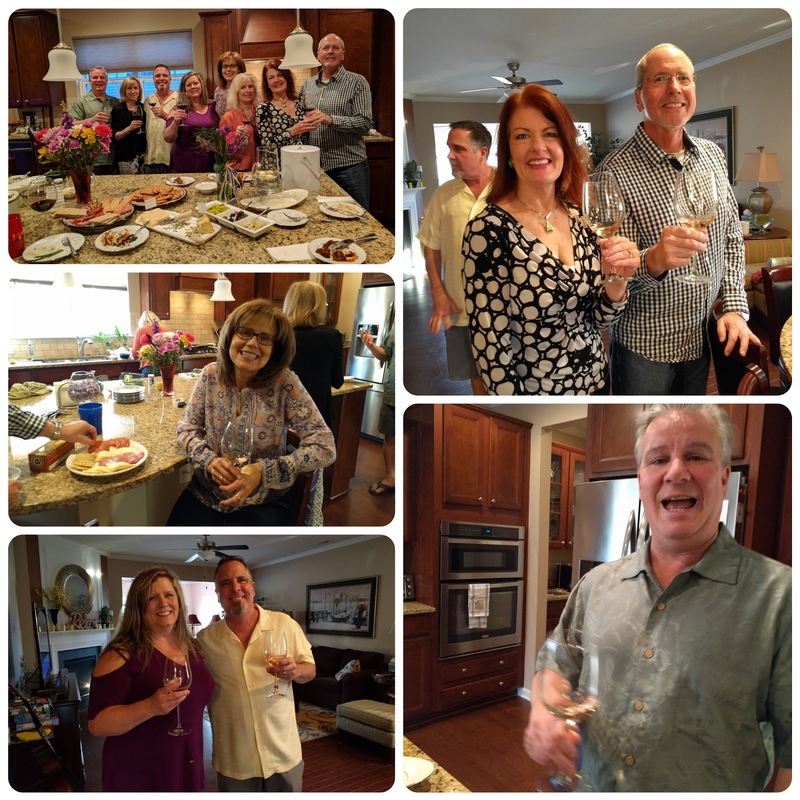 Kicking off the party was the 2018 Fleurs de Prairie Rosé. In reviewing background material for the wine, I noticed that the wine is a tribute to the fields of flowers in the Cotes de Provence region. Wisteria flourishes in this part of France as it does in our hometown. We quickly were on an expedition (successful!) to find wisteria for a nice centerpiece. 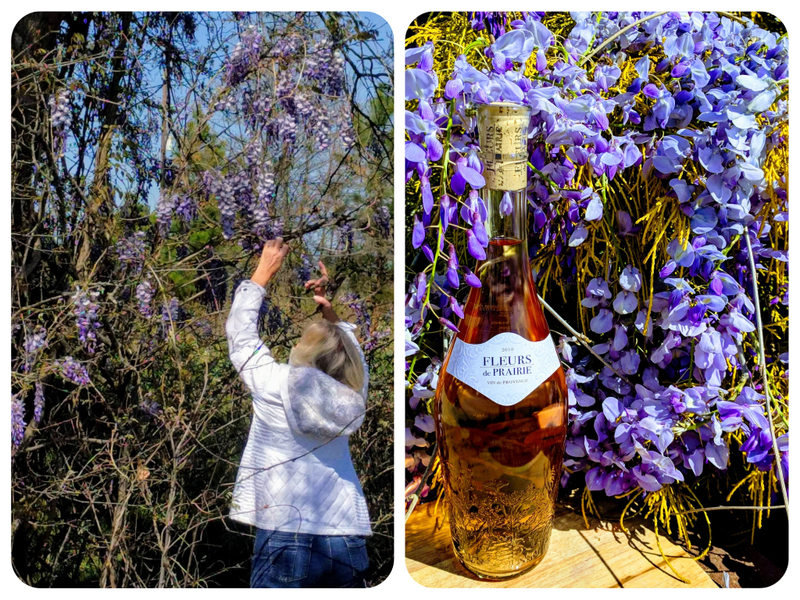 Fleurs de Prairie is a beautiful rosé, perfect for a spring filled with blooming trees and flowers. It is a blend of Grenache, Syrah, Cinsault, Carignan and Mourvedre that tastes light as a feather, with delicate flavors of strawberry with some herbal notes. Just the right amount of acidity makes this a balanced wine, and one perfect to pair with light dishes. The price is about $17. Fleurs de Prairie is also notable for its Seeds of Beauty campaign, which recognizes and supports women who are dedicated to creating beauty in their community. Seed grants of $2,500 are available. Navarra is a northern Spanish wine region known for its beauty and diverse terroir. It is also home of the famous Camino de Santiago (Way of St. James) which influenced many winegrowers to use French grape varieties such as Chardonnay and Cabernet Sauvignon. 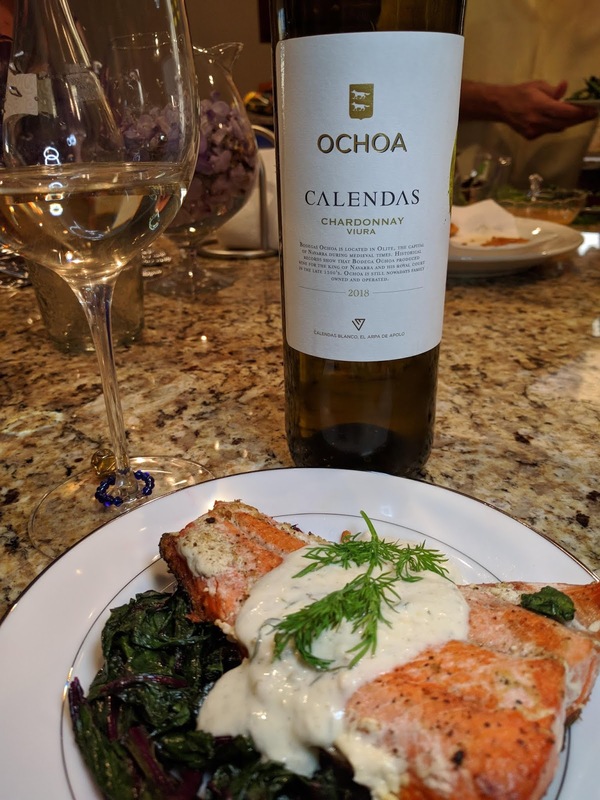 The Ochoa Calendas is a blend of 75% Chardonnay and 25% Viura, a well respected white grape. We paired this with pan seared salmon with lemon garlic cream sauce. This is a nice blend, with the Viura adding freshness and nice acidity to balance the classic Chardonnay flavors. It was perfect with our salmon. A bargain at just $12 SRP. 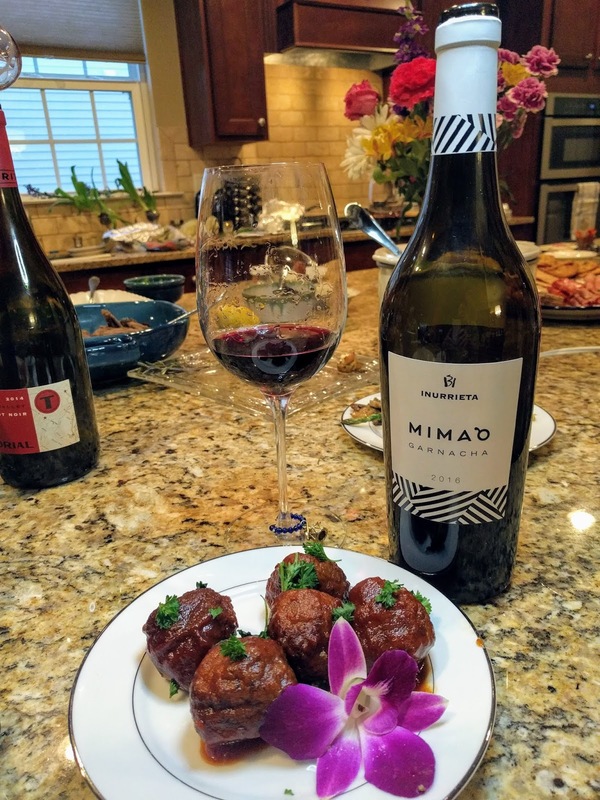 Garnacha from Spain can often take on a rustic flavor, but the Inurrieta Mimaò is a smooth sipper. 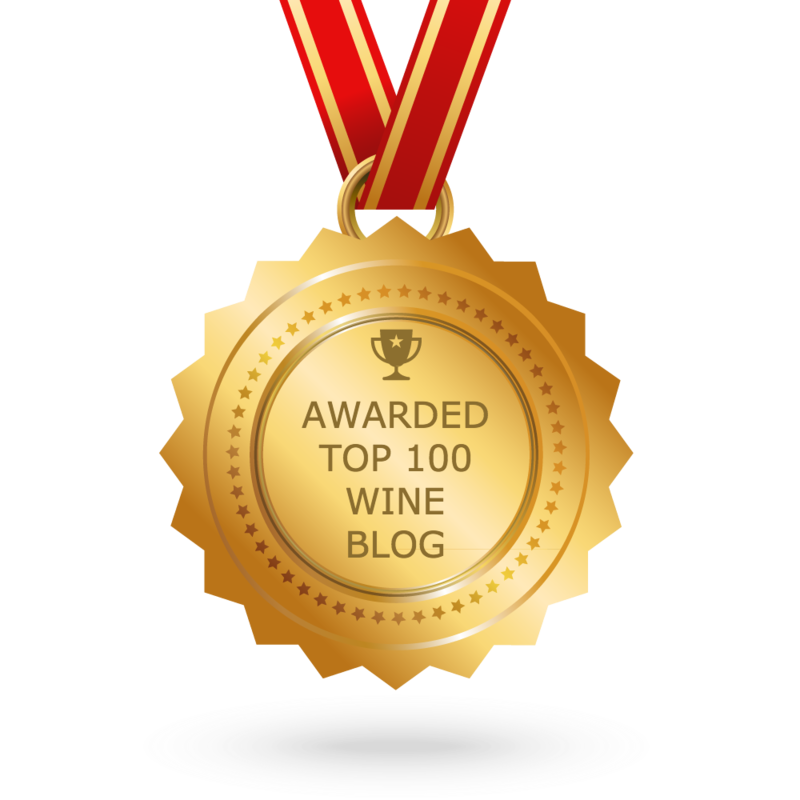 It is fermented in stainless steel and gets malolactic fermentation to add a plush texture. It is finished with seven months in French oak. We found this to be a very pleasant surprise with mineral notes and plenty of ripe fruit. This reminded me of the French Grenache style, light, easy and very satisfying. This is also a steal at $15. We’ll be on the lookout for more wines from Navarra. 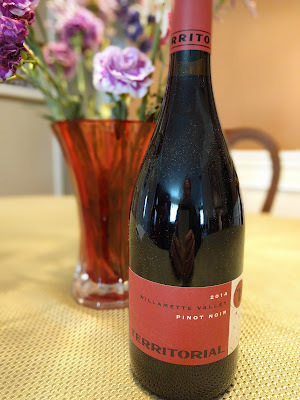 Is it possible to have a good party without serving Willamette Valley Pinot Noir? I guess it is theoretically possible, but we didn’t want to take a chance. This Pinot from Territorial Vineyards is juicy with plenty of savory notes. We served it with rosemary seasoned chicken sausage with grilled apples and gouda. The acidity and tannins are knit together well in a balanced wine with plum and blueberry flavors. Eighteen months in French oak is the crowning touch for this beautiful bottle. It is well priced at $26. Dry Creek Vineyard Meritage has long been one of our favorite wines. It’s a blend of some of California’s best grapes and this Sonoma wine comes with a much lower price tag than its Napa Valley neighbors. 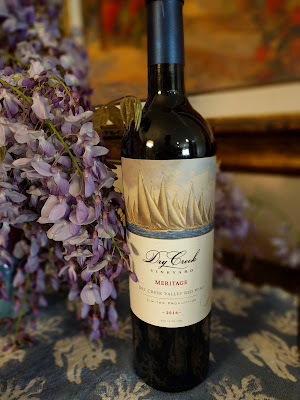 In 1985, Dry Creek Vineyard was the first to produce a wine with “Meritage” on its label. The 2016 vintage is 65% Merlot, 16% Cabernet Franc, 10% Malbec and is rounded out with Petit Verdot and Cabernet Sauvignon. The wine is aged for 20 months in a combination of French, Hungarian and American oak and so it needs to open up to be fully enjoyed. The drinker is rewarded with big flavors of black cherry and currant with some spice and leather notes. Just beautiful! This wine is priced at $30 and is also a good pick to cellar for three to five years. We had one more mystery for out “going rogue” tasting party crew. 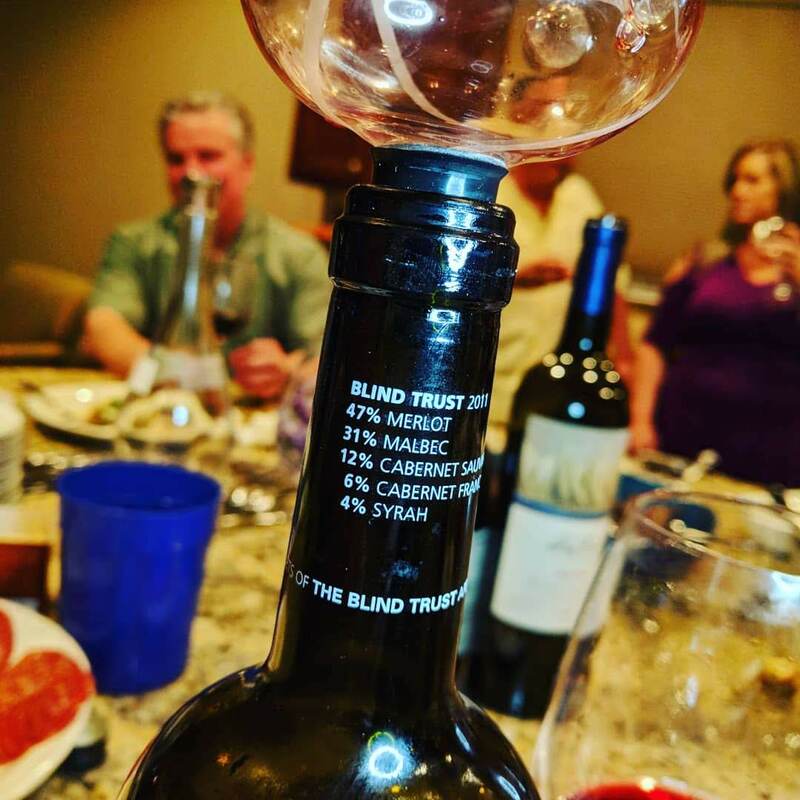 The Blind Trust wine from the British Columbia winery Laughing Stock doesn’t advertise its blending grapes. When I purchased the wine it was with blind trust because we love wines from Okanagan Valley. The blend isn’t revealed until the bottle is opened and the capsule pulled away. The Blind Trust was justified. This is a great wine with a blend of 47% Merlot, 31% Malbec, 12% Cabernet Sauvignon, 6% Cabernet Franc and 4% Syrah for good measure. This wine has swirling minerality with beautiful herbal notes to give this a unique character. Blueberry and black cherry lead the way. Wines from Okanagan are outstanding, but few reach the US, unfortunately. The current vintage of Blind Trust is sold out (we’re not surprised!) 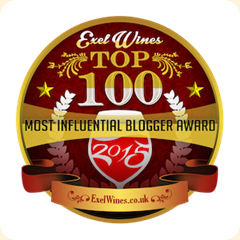 so we recommend investing in the 2016 Portfolio, a nice Bordeaux style blend. You don’t need our permission to “go rogue.” Just pick up a bottle or three and uncork! Full disclosure: Some of this wine was provided as a marketing sample.